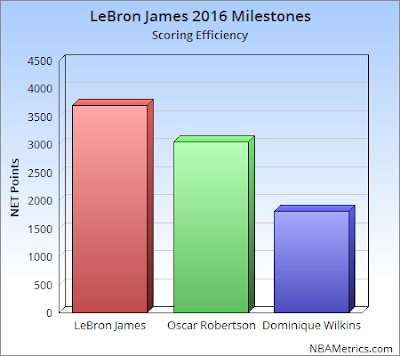 NBA Metrics: LeBron, Oscar or 'Nique, Who Is The Best Scorer? LeBron, Oscar or 'Nique, Who Is The Best Scorer? This week LeBron James passed two iconic names on the NBA's career scoring list. With Dominique Wilkins and Oscar Robertson now in his rear view mirror LeBron is 11th all-time in total points. But looking at points in isolation leads us to conclude all three players have similar scoring abilities. Dig a little deeper and we see big differences. Scoring lots of points is great but at what cost did those points come? Each shot attempt is the use of a possession which is a valuable resource. So how many "resources" did each player burn to accumulate these points? Dominique Wilkins took 1,800 more shots than LeBron James. Oscar Robertson used 600 more shots than LeBron. Since they all scored about the same number of points we can conclude that James is the most efficient scorer of the three. This chart confirms that LeBron James is already a good distance ahead of the other two hall-of-famer's in total scoring efficiency. This is step 1 of 2 we take when determining the value of a player's scoring ability. The second involves adjusting the use of those "resources" (shots) to league average. This is explained on NBAMetrics as 'Points Scored Above Average'. The career scoring leaders when accounting for their peers looks different still than the 'NET Points' leaders which is not adjusted for league-wide shooting performance. Players like Oscar Robertson who excelled during the poor shooting 1960's look even more impressive when compared to their league's average.